Team work is great when it works, but what do you do when one team member decides that they want to change the plays of the game with no warning? Imagine watching a pro-football game and the quarterback calls the play, the team gets set and then the quarterback steps back to throw the ball to the receiver (according to the game plan) and the receiver has decided to run a different route. The quarterback stops, stares in amazement as his receiver is not in sight and then he has to make a quick decision what to do with the ball. If he throws it there may be an interception and if he tries to run with it he could get sacked and lose the ball. What happened to the game plan? Working on a team each player needs to be able to work independently yet each player is dependent upon the other players to complete their plays so the end result is what was planned. When a team player decides that they are going to change how they contribute to the play without consulting or informing the rest of the team, confusion and dysfunction occurs within all of the team players. Independent plays can destroy team morale and function and need to be addressed so that the team can regroup and move forward together. Left unaddressed independent players will assume that what they are doing is acceptable and will continue to play according to their game rules. 1. Adaptability –Being flexible in what you need to do and help your teammates to reach the common goal together. A cohesive team will know what each team member needs to do and come along side them to support that it is accomplished. 2. Effective Communication – All team members need to know the game plan and why it needs to be executed in the manner laid out. If one team member feels that the plan needs to be changed, they need to address it with the team as a whole and not act independently, just hoping the rest of the team will follow their lead. 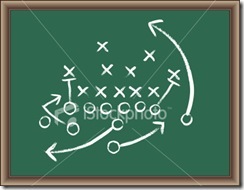 Independent team player moves that go against the game plan are destructive to the goals of the team. As a team member if you feel you have a better way to complete the play make sure you discuss it with the team captain and make sure that all team players are onboard before you make a move that could cause your team to lose the game. This entry was posted on Monday, February 16th, 2015 at 8:00 am by Tina Del Buono, PMAC. Filed under Employee Training, Leadership, office management, Team Work. You can follow any responses to this entry through the RSS 2.0 feed. Both comments and pings are currently closed.